Studio cabin with a virtual view on Quantum of the Seas. Until recently, the cabins on modern cruise ships were designed and sold based on the idea that all of the cabins would be occupied by a minimum of two people. If a person wanted to cruise on his or her own, he or she had to pay a single supplement, which could be as much as 100 percent of the per person double occupancy price. 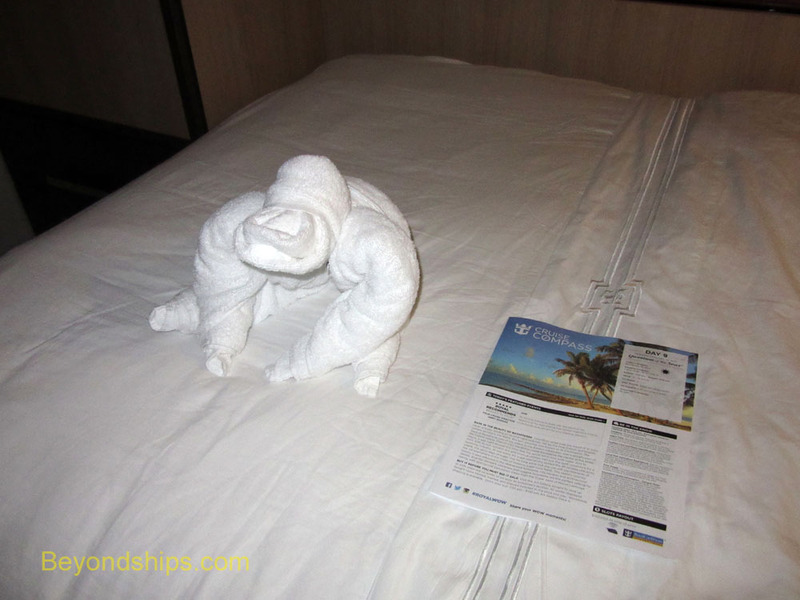 Now, however, more and more cruise lines have been including single-occupancy or solo cabins on their new ships or adding such cabins to their existing ships. In general, these cabins are not as large as a double occupancy cabins but then they are only meant to accommodate one traveler. Also, they usually cost more than the per person double occupancy rate but then you do have the cabin to yourself. The list of lines catering to singles now includes such major names as Norwegian Cruise Line, P&O Cruises, Cunard Line and Royal Caribbean. 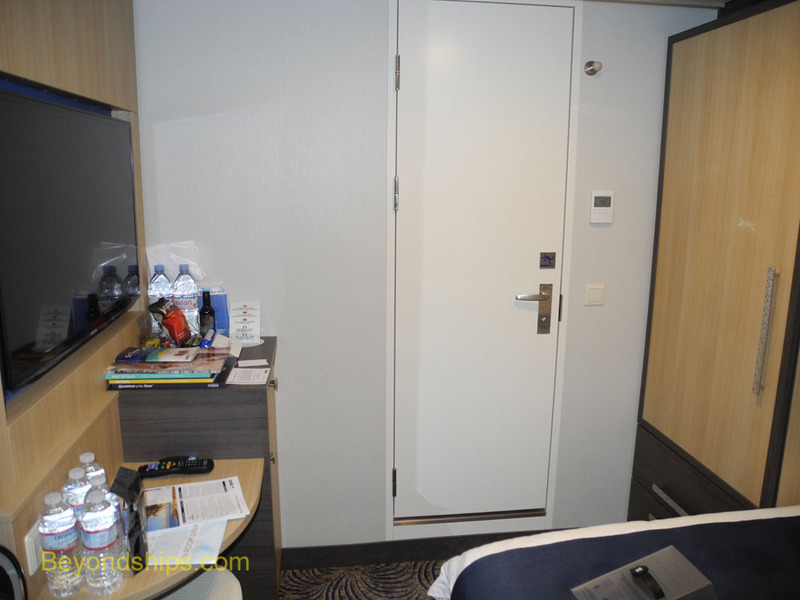 Quantum of the Seas is the first Royal Caribbean new-build ship to come out of the shipyard with single-occupancy “studio” cabins. 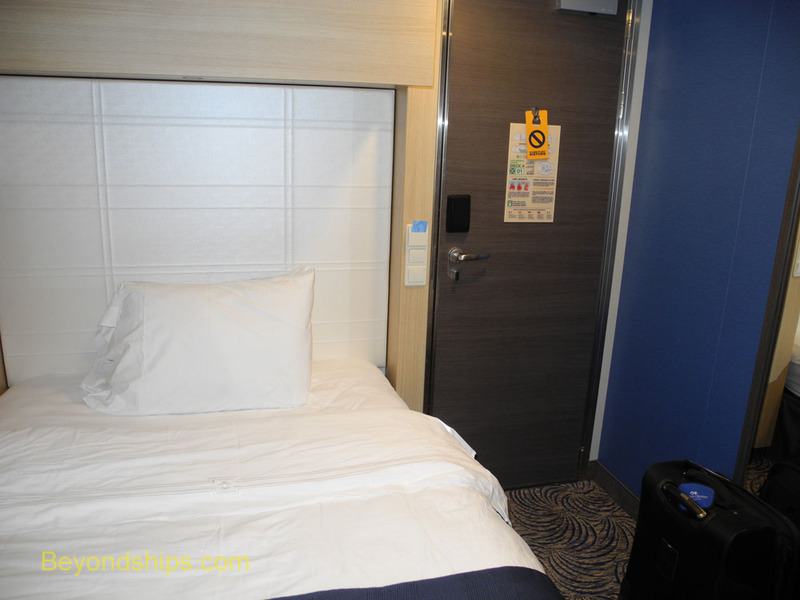 There are 28 such cabins on the ship - 12 with balconies and 16 interior staterooms. 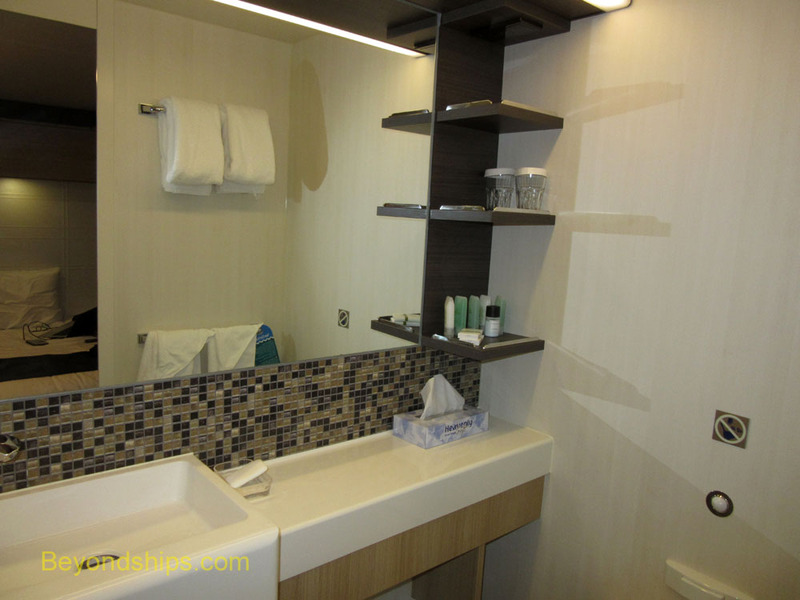 In contrast to the studio cabins on the large Norwegian Cruise Line ships, the studio cabins on Quantum are traditional in style. They include both a sleeping area and a separate bathroom. Most of the sleeping area is taken up by a queen size bed. However, there is also a small vanity with stool, a refrigerator, a cupboard which contains the closet, a pair of drawers and the safe. There is also some storage space in a cabinet over the bed. You would be hard pressed to hold a cocktail party in this space but I found the sleeping area comfortable. In addition, there was enough storage space so that I did not have to leave anything in my suitcases under the bed. The bathrooms are relatively spacious. Rectangular in shape, there is a full shower with a glass door at one end and the toilet at the other. A small sink, some shelves and a mirror are on the long wall opposite the door. 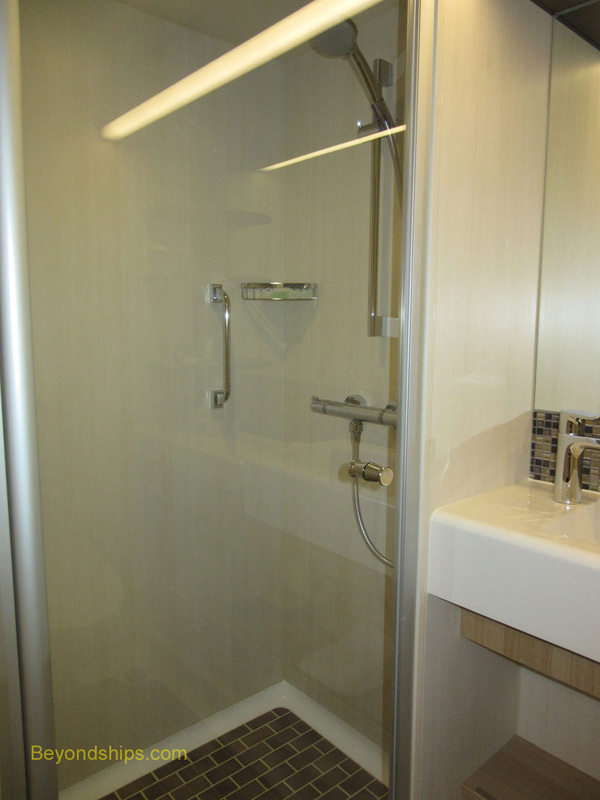 I have seen bathrooms in double-occupancy cabins on other ships that are much smaller than these. Because my cabin was an interior cabins, it had no balcony or porthole. However, I did get a virtual view via the large screen mounted next to the bed. From the screen on the port side of my cabin, I could see a view that was similar to the view one would get from a port side window. Thus, I was able to see what the weather was like outside, whether it was day or night and whether we were at sea or in port. I had thought beforehand that having what is essentially a television screen on all of the time might be annoying after a while. However, it did not prove so. In addition, I had the option of switching the picture off or covering the screen by drawing the curtains that surround the screen. It should be noted that the virtual view screen is not the cabin's television. On the opposite wall, was a large flat screen television. Using this screen, I could view my onboard account, my calendar, shore excursion previews and see promotional messages from the spa, the photo department, the next cruise desk and other onboard departments. The television also had on-demand movies as well as a selection of complimentary news, sports and entertainment channels. Most of the studio cabins are arranged so that they can be combined with neighboring cabins to form a large suite. Say a couple wants to travel with one of their parents. If they book the outside cabin and the adjoining studio, the couple and the single parent can each have their own bedroom. To this end, my cabin door opened into a vestibule that was also shared by the neighboring balcony cabin. Another door - - with a lock - - separated the vestibule from the outside corridor. Thus, if we had been a family traveling together, the two inner doors could have been left open and the outer door closed to keep out the outside world. Quantum is still developing its solo travelers program. On the sea days, the daily program invited solo travelers to gather for lunch at noon in the American Icon Grill. Solo travelers interested in meeting other solo travelers could also post notices on the ship's community bulletin board. However, no member of the activities staff is assigned to oversee and devise activities and events for solo passengers. Above and below: The opposite ends of a studio cabin.